I have been in need of retail therapy, which is probably all the time, in actual fact it is all the time! But there is nothing better than treating yourself to a few new purchases right? I am one of those people that tend to look at reviews but that only applies if it is a high end product. All of the items above I have read great things about. 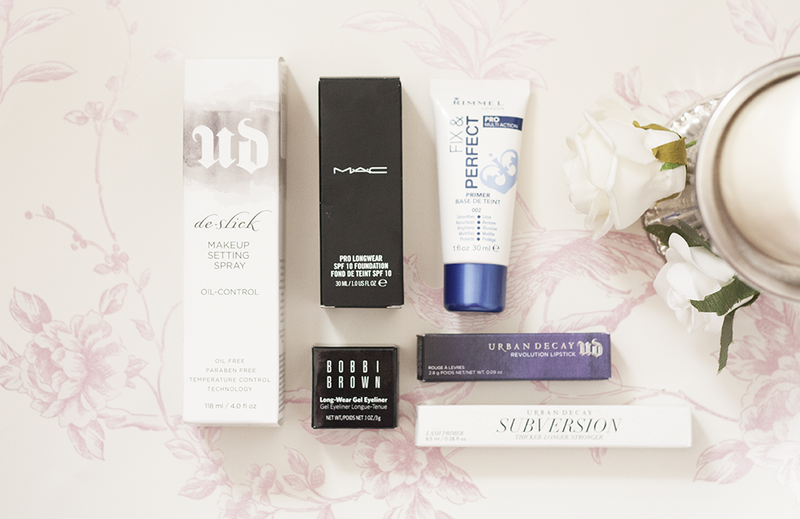 As for the Mac foundation - that is my holy grail - I had to include as it is my favourite foundation. I have combination skin which is such a pain as I see my skin being greedy! But I've realised that a setting spray is the way forward. So I decided to purchase Urban Decay's De Slick specifically for controlling that oil! So I am excited to see if it does keep it set. Rimmel London Fix & Perfect Primer, it's aim to do many wonderful things and it definitely does them all. I have been wearing this under all sorts of foundations that I own and I have to say it is brilliant. I used to use Smashbox and that was so pricey but this one, does the exact same for such a cheap price! Bobbi Brown LongWear Gel Eyeliner, only got to use this once so far - however it's not as black as I thought it would be...don't get me wrong I adored it the first time I have used it, but maybe I need to layer it up more, what are your thoughts? Urban Decay Lipstick - Native, if you love a pink shade like I do, I suggest you add it onto your wishlist ASAP. This is my first lipstick from Urban Decay and oh wow, it is good. I think I am more impressed with it, than I am with MAC, I'm not sure yet. What are some other shades that you all love from Urban Decay? Urban Decay Eyelash primer - Subversion, my last item which I can not get enough of. I have long eyelashes but they do not hold a curl at all. However a coat of this and your favourite mascara it's a solved puzzle. I've been meaning to pick up an Urban Decay setting spray for FOREVER! But they do loads of different ones, right? How did you choose? I love the Bobbi Brown liner! To be honest though, I don't like a really dramatic black most of the time, so maybe that's why!